So what I really need to do since its been 6 years since I posted here is to decide what to do with this blog site. Transfer everything over to 'Stream of Consciousness' or what ?? These are some photographs of a January 2009 cruise to the Bay of Islands, I will add photos over time (it takes forever to upload photos). 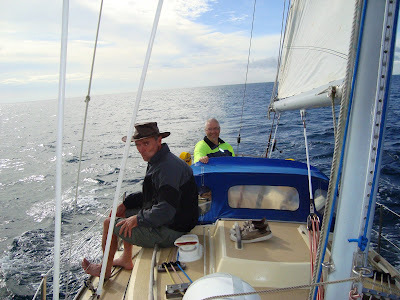 The trip took 2 days from Whangarei to the Bay Of Islands against Northerly winds with two other crew members. I spent about a week in the BOIs with my wife. The return trip took 2 days with yet another crew. Here is the good ship Mariner being lifted out so that she can be waterblasted and placed in a safe cradle ready to have antifouling paint applied under the waterline. 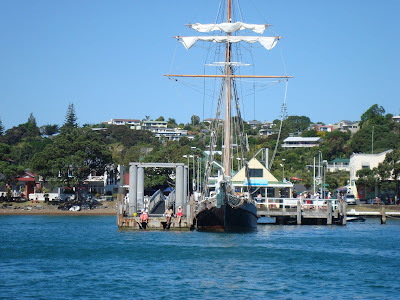 She will be out of water for the next few days and then its back in and off up the Northland coast to the Bay of Islands, a safe haven for day sailing and holidaying. 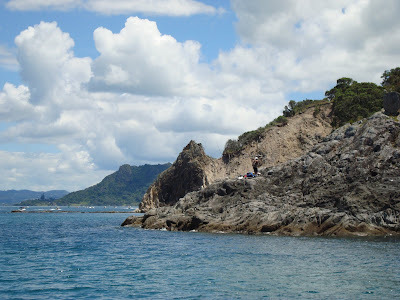 There are plenty of safe anchorages at night in the Bay Of Islands and plenty of yachts and boating activity taking place. It's a very busy place over the holiday period. The area caters for not only overseas visitors at this time but also a very big contingent of New Zealanders from Auckland and further afield. 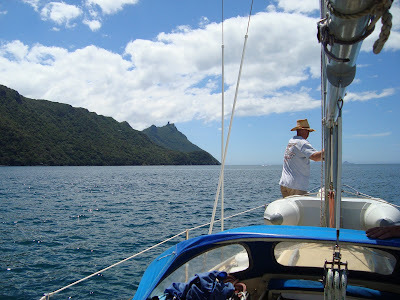 The BOIs is a popular destination for Auckland and Whangarei yachts for the holiday period. There is always a huge fleet that comes up from Auckland every year during this Christmas and New Year period. 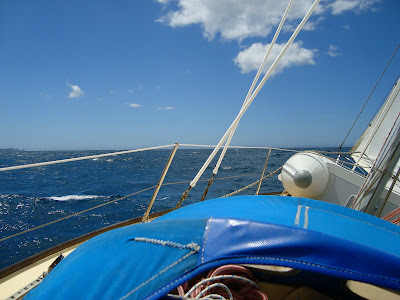 The trip up the coast has a number of safe anchorages along the way that provide boltholes if the weather turns nasty. So high summer is upon us, the warm winds are blowing, the pohutakawas are in full bloom and my eyes are cast seaward towards the horizon and all that this promises. Bon Voyage Mariner and to all who will sail in her. Parua Bay Whangarei New Zealand - Photo Alden Smith - Note the new jetty, the old one was destroyed by a number of yachts that either broke free of their moorings or dragged their huge mooring blocks in the last big storm here in Northland NZ. This nice looking double ended yacht in the foreground of the picture was recently launched here at Parua Bay which is about 15 Kilometres as the crow flies from Whangarei city. The yacht was built by our school bus driver over a number of years. 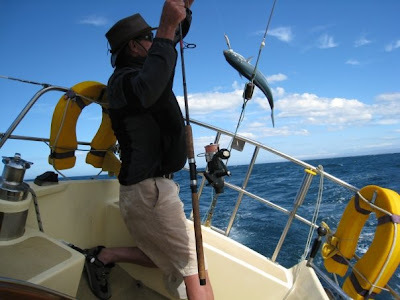 He is an experienced yachtsman who both designed and built the boat himself. 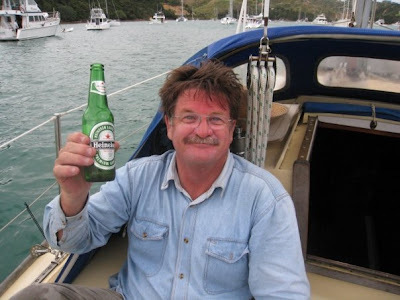 Amateur yacht building is a bit of a tradition in New Zealand - its heyday was in the 1970s before the world went completely barmy, a time when people worked only 40 hours a week for a living wage and had time to indulge their passions and interests in building and creating. These days we are a society that seems to live to work rather than to work to live. More is better in all things is the clarion call to all this madness. 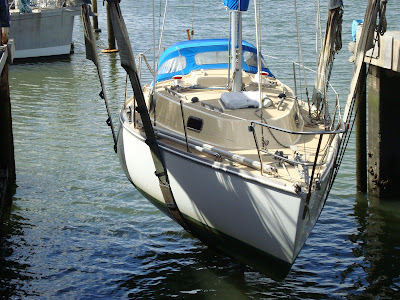 When the yacht was launched she was found to be out of trim - she was floating down at the bow. Unperturbed by this our bus driver took the boat out, took off the four or five tons of outside lead ballast and re - positioned it in the correct position after having the lead recast. " I thought the original calculations were correct" he said with a wry smile - "Was it a bit frustrating having to do all that extra work? " I asked him. "Not as much work as building the boat itself" he replied in a rather matter of fact way - bus drivers are like that, practical and down to earth - I have never been asked directions by a bus driver yet. They know what they're doing. During the 1930s J-class yachts were built to race in the America's Cup. Only 10 were ever built as they were extremely expensive to build and maintain, especially in the post war years. 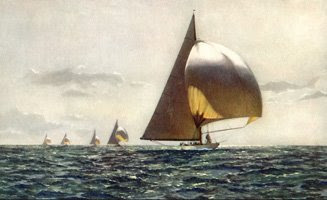 They succeeded the 1883 Seawanhaka Rules 75-footers of 1920 and were replaced by the 12 - metre class yachts when the Cup was challenged again in 1958. The J designation refers to the class of yacht defined by its sail area, displacement, length, and mast height, formally defined in the Universal Rule. When designing a J-class yacht builders would have to decide which characteristics to maximize to build the ideal yacht. All three America's Cup races featuring J-class boats were won by the New York Yacht Club. In 1930 Enterprise defeated Shamrock V of the Royal Ulster Yacht Club. In 1934 Rainbow defeated Endeavour of the Royal Yacht Squadron. In 1937, at the peak of J-class racing, the "Super J," Ranger defeated Britain's Endeavour II. Only three of the original yachts are still sailing today; Shamrock V, Velsheda and Endeavour. They have all undergone extensive restoration and rebuilding. A replica of Ranger was launched in 2004. As of April 2008 another three yachts are being built or planned. These are Endeavour II, Lionheart and Svea. According to J-class regulations, any new yacht built must use existing designs from the 1930s. 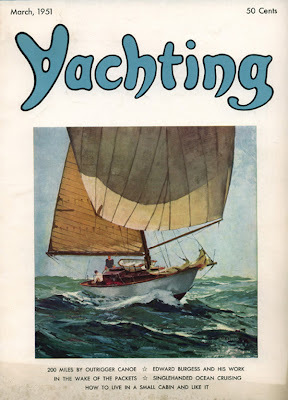 This copy of the American "Yachting" magazine was first read by my father three months before I was born - note the price - they are now about $15 - $20NZ. Pretty pricey really, especially if you are a boat fanatic like myself. If I was really obsessive about purchasing every sailing magazine I laid eyes on I could easily spend in the region of one to two hundred dollars a month. But I don't. I am one of those people at the magazine stand who flicks through and only buys if there is something really interesting and valuable. I have learnt to use the library. 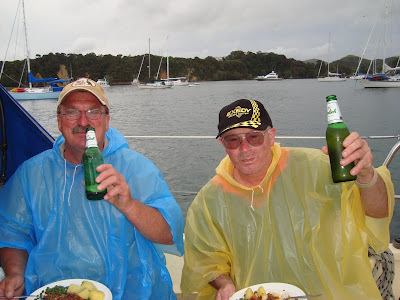 Old sailing news is still good news in my book and well worth the wait. I sometimes take a stack home from the local library and saunter my way through them. In his time my father was a great collector of sailing magazines and our hallway cupboard was full of the Yachting Monthly, Yachting World, Yachting, Rudder, Sea Spray, Wooden Boat, Sail magazine and many more. I can still see him kneeling in the hall in a sort of genuflection to his hoard of yachting magazines. They gave him a great deal of pleasure and like a good CD or book he came back to them more than a few times. I have to say as I grew bigger and developed my own interest in sailing and sailed my own centerboard yachts on the local estuary I too spent some time kneeling in a draughty hallway flicking through a stack before lugging it off to a comfortable chair for closer examination. I remember all this with fondness. The formation of formative years is enduring and the practise continues from time to time to this day. Today I pretty much only purchase the English edition of Classic Boat magazine on any regular basis and I get a lot of pleasure from reading this. It is full of articles about wooden boats which I am particularly fond of. My sailing library now includes a huge number of sailing books about yachts and voyaging and almost every maritime facet in between and a fair old stack (and it is old) that I have inherited from my father. "Give me the child until he is seven and I will give you the man" - I didn't have a chance - but look at me - I'm smiling and I KNOW what the wind is saying when it begins to stir in the trees.